Add question and answer functionality (similar to Quora, StackOverflow, or Yahoo! Answers) to your website, blog, or WooCommerce store. If you’re looking for a complete recipe solution for your next website or blog, this hand-picked roundup offers some of the best WordPress recipe themes you will find anywhere. 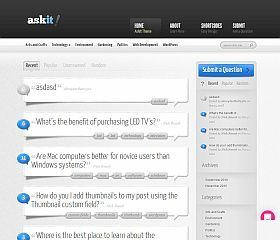 AskIt – is technically more of a WordPress theme than a plugin, does offer a total solution for those looking to create a Q&A site (or section within an existing website). It’s a full-featured solution that offers all of the functionality, support, and features that you would want – and since it’s from Elegant Themes, you’ll get access to all 87+ of their WordPress themes when you join. WP-Answers offers a complete solution for creating a question and answer website (or section for an existing site). It can be used as a plugin for an existing site or comes with its own theme if you’re wanting to set up a completely independent or new site. Sabai Discuss is possibly the most advanced plugin in this collection. With features galore, it gives anyone who uses it one of the most comprehensive and complete answers solutions. DW Question & Answer Pro provides one of the most comprehensive, complete, feature-rich, and advanced plugins for WordPress answer sites (or sections) that you will find offered anywhere. Every last detail has been given special attention to this free plugin, from the beautiful design qualities to the amazing features and functionality – it’s all packed into this robust solution. AnsPress is a great-looking plugin that may become one of the most popular options for those looking to create a question and answer section for their site. Question Answer gives you the ability to set up a question and answer section on your existing website or blog. Features Include: Schema.org support/integration, the ability to easily create archive and account pages via shortcode, and front-end submission of questions. WooCommerce Product FAQs allows you to easily create a FAQ (frequently asked questions) section for each of your products with this free WordPress plugin. YITH WooCommerce Questions and Answers will give your visitors the ability to comment, ask questions, and discuss your products on each page. It will give you a commenting/question system similar to Amazon.com’s and is displayed in a separate tab on each individual product’s page. WooDiscuz is a free plugin that gives you added features and functionality for your products. Those using WooCommerce to power their store will find that this adds an extra layer of depth, content, and customer satisfaction by allowing your visitors to comment, question, and even vote on answers for each individual product. Over the past few years there has been much interest in question and answer (Q&A) sites. Entire businesses have been built around this particular content and publishing model (Yahoo! Answers, Quora, StackExchange, ChaCha, and others) – all vying to provide the most succinct or comprehensive solution for their website’s visitors. It’s certainly an attractive business model relying heavily upon user-generated content – which not only creates an ever-growing, evergreen site, but has also proven to attract a lot of search engine traffic and social sharing as well. Many have undertaken an effort to create a site of their own or created a special section on their existing site, giving them leverage in both the social media sharing aspect and the SEO benefits that can accompany these types of websites. Fortunately, instead of building a question and answers solution from scratch – there are a handful of ready-made plugins for WordPress that can bring the functionality to your site. While you may have browsed my question and answer theme roundup (which provides complete solutions to this model), the items listed on this page take a more specialized approach in the form of plugins. These plugins can be especially useful for those looking to add functionality to an already-existing site.